Ancient-Future Faith: What Has It to Do with the Atonement? Well over a decade now my late friend Robert E. Webber wrote, “The kind of Christianity that attracts the new generation of Christians and will speak effectively to a postmodern world is one that emphasizes primary truths and authentic embodiment” (Ancient-Future Faith: Rethinking Evangelicalism for a Postmodern World. Grand Rapids: Baker, 1999, 27). I share Bob’s view and believe the last fourteen years, since his words were published, have underscored his point even more clearly. Theologies of redemption . . . offered only to the human race, and not something integral to the entire universe . . . are inadequate. Those that focus on the individual are positively harmful. Christologies that imagine Christ as less than cosmic are merely parochial. Theologies of the church that stop at the political, still more so those that remain ecclesiocentric, fail because they cannot conceptualize Christian discipleship in the service of a sick planet. Eschatologies that imagine that the spiritual can have a reality aside from the material are simply naive (quoted by Webber, 27). Webber believes that Lakeland was correct. He further believed that classical Christianity can speak to a more holistic and integrated view of life if we rediscover the fathers of the early church who carefully worked out their theology in the context of “mystery religions, polytheism, gnosticism, cults such as Manichaeism, and the philosophies of Plato, Aristotle, Stoicism, and Neo-Platonism” (27). Their theology [the early church writers], being in such close historical, geographical, linguistic, and conceptual proximity to the New Testament era and to its parent religion, Judaism, is characterized by a sustained attempt to remain faithful to the apostolic tradition (27-28). Webber develops this rich and highly nuanced sentence by offering six ways that this can be demonstrated. The early church was responsible for summarizing the general doctrines of the faith in creedal form. To this day the whole church is still united in confessing this common, core Christian faith. We recognize the early church’s role in establishing the canon of Scripture. This formation was a process and took several centuries. More than 1,500 years later we still accept this common rule of faith (canon) throughout the entire Christian Church. The ancient church provided foundational thought on ecclesiology, ministry and sacraments. Even where we disagree about these subjects we cannot get too far afield from the thought of the earliest Christian thinkers and writers if we are to remain rooted in the faith. The ethical approach of the first three centuries to war, abortion, infanticide, marriage, and numerous other subjects, including the church’s relationship to society in general, can and must shape our approach today. We have passed through a period of time in which the church, left and right, has been deeply drawn into radically partisan ways that are not Christocentric. We desperately need to recover this early church perspective. The early church wrestled profoundly with worship in the early centuries. How are we to worship God in our Christian gatherings as a community? The form of worship has become a veritable nerf football in most evangelical churches. The answer to the so-called “worship wars” is to recover this ancient-future faith perspective. 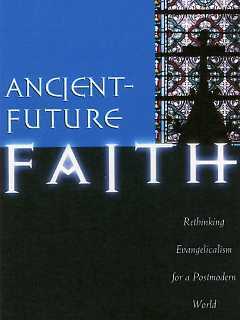 I want to put the doctrine of the atonement into this ancient-future faith paradigm. I believe that we must recover the classical Christian understanding of the cosmic Christ. This is the Christ who stands at the very center of the universe, the Christ who gives meaning to all of life, thus the Christ who informs everything we believe and do in this world. If we are to understand the atonement more clearly then we must submit our understanding of this doctrine to the witness of Christian history, not simply to the arguments of evangelical (rational) exegesis. We have placed a false confidence in our own ability to grasp the meaning of everything we know and believe in a scientifically precise way. This is the fruit of modernity, not the fruit of ancient Christian faith and life, rooted in Christ the center. Spot on John. Another thought has to do with memory and remembering. The post modern church needs to remember. More than that we as followers of Jesus need to remember. Not for the sake of judgement ….for the sake of love. If we cannot really remember how can we really love? Jesus’ life death and resurrection is the foundation of the churches love through time. We are the people that remember and because we remember we love. Peace brother! Greg Moser liked this on Facebook. Tim Gregson liked this on Facebook.